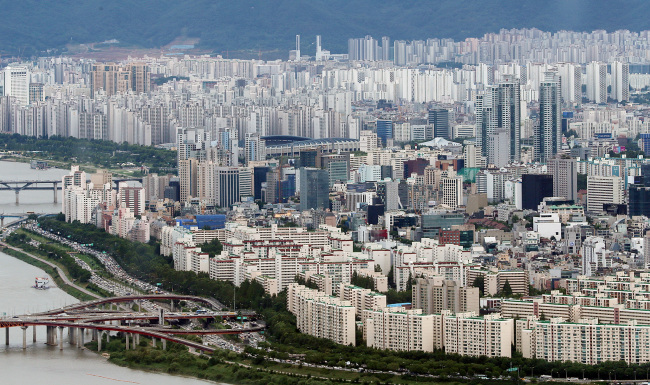 South Korea’s 11 real estate trust companies logged a combined 285.3 billion won ($253.1 million) net profit in the first half of 2018, surpassing their performance in all previous half-years, preliminary data showed Monday. The figure represented an on-year increase of 17.6 percent, and business was in the black for all 11 companies, according to the Financial Supervisory Service, Korea’s financial watchdog. Meanwhile, the companies’ operating profits soared 17.1 percent on-year to 376 billion won for the first half. Operating revenue jumped 21.9 percent to 588.9 billion won, spurred by increased revenue from fees or commissions, mainly from land trusts. The strong showing made up for a 31.4 percent on-year increase in operating expenses. The companies also showed greater financial stability. Their average net capital ratio stood at 874 percent as of end-June, up 48 percentage points from end-2017 -- well above the 150 percent that the FSS considers an indicator of financial soundness. The FSS said in a statement that it would continue to monitor the companies closely, citing the inherent risks associated with development-oriented land trusts, as a weak real estate market can easily undermine the trust companies’ financial soundness. Korea has been home to 11 real estate trust companies since 2009: Kukje Trust, Daehan Real Estate Investment Trust, Mugunghwa Trust, Saeng Bo Estate Trust, Asia Trust, KB Real Estate Trust, Koramco REITs Management and Trust, Korea Trust, Hana Asset Trust, Korea Asset In Trust and Korea Real Estate Investment & Trust. The Financial Services Commission, Korea’s financial regulator, has suggested that it might also grant real estate trust business licenses for additional Korean financial institutions in the third quarter of 2018.